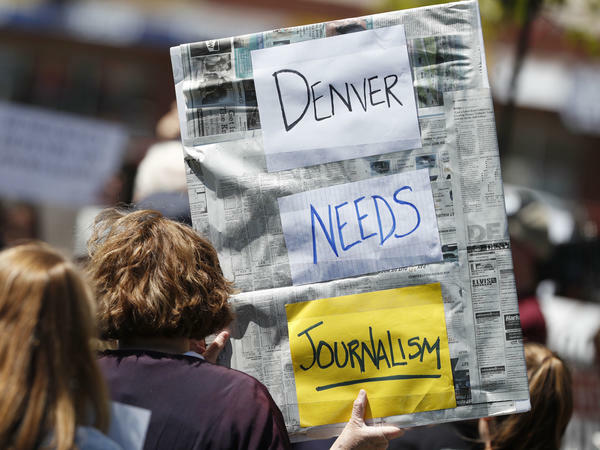 An Denver Post employee holds up a sign during a rally against the paper's ownership group, Alden Global Capital, on May 8 outside the paper's office. A series of layoffs have slashed the paper's newsroom staff. While Digital First Media still operates on upper floors, none of those things happen in the Denver Post building. The Post has left. And that's no longer exceptional. The Baltimore Sun, owned by the Tronc company, this week became just the latest newspaper moving out of its historic building downtown to work in far cheaper digs. What journalists find galling in Colorado: a round of layoffs last fall was accompanied by the announcement of the newsroom's move to the paper's printing plant in the suburbs. Management officials said the moves would stave off future layoffs. That was in November. Then, in March, Digital First laid off a third of The Denver Post's staff. Colorado's largest news organization is shrinking — and shrinking fast. "Those are a lot of stories that aren't getting covered," says Larry Ryckman, a former senior news editor at the Post. "People who aren't being celebrated. Bad guys who aren't being exposed. Corruption that isn't being exposed. We just don't know. We don't know what we have lost as a community. " Denver's loss echoes in communities across the country, not least because the controlling owner of the Post (and Digital First Media), a private equity firm called Alden Global Capital, controls nearly 100 print and online publications. Alden Global has ordered up one round of cuts after another in recent years for papers throughout the country. Cuts have also been severe at the Tronc newspaper company, which recently slashed the New York Daily News newsroom in half in a single day. In Denver, the newsroom now stands at less than a third of what it was at its peak about six years ago, according to former editors and reporters there. The trends in the business are grim, as digital revenues do not compensate for deep losses in print income for local newspapers. Yet The Denver Post has been profitable, according to industry analysts. The headline on one such analysis by Ken Doctor of Newsonomics: "Alden Global Capital Is Making So Much Money Wrecking Journalism It Might Not Want To Stop Anytime Soon." "In the seven-county area in the metro [region], I cover pretty much everything outside of Denver," says John Aguilar, a reporter for the Post. "We're kind of starting to find people's breaking point now. Whereas the previous cuts, I think people kind of hung in there and just try to see what would happen next. Now you're just seeing people leaving, in large numbers, beyond the cuts that were made in March. And I hadn't seen that happen before." But on the same day a study released by Duke University's Sanford School of Public Policy found fresh evidence of "news deserts" — areas where news coverage of important local matters was limited or absent. It found that smaller communities in the shadow of big metro dailies and TV news stations often enjoyed little coverage. And it found a diminishing amount of original local coverage in those news organizations that do survive. "In addition to running a breaking news team and having a couple of enterprise reporters, I had to do Web production," Coffield says. "I was liaison with the photo department. I was, you know, jack-of-all-trades and very quickly becoming master of none." Ryckman says he quit earlier this year after writing a story covering the departure of the paper's former editorial page editor. That editor, Chuck Plunkett, resigned in the wake of an editorial in which he called for Alden Global Capital to sell the paper. The words "Alden Global Capital" did not appear in Ryckman's article (although they did surface in a searchable "tag" at the bottom of the article's Web page). Ryckman says the paper's editor, Lee Ann Colacioppo, forbade him from including Alden's name in the article. "I've never ever had somebody tell me not to include a fact in a story," says Ryckman, a former national editor and Moscow correspondent for The Associated Press. "I had more freedom as a reporter in Russia than I did as an editor under Alden Global Capital." Neither Alden Global's president, Heath Freeman, nor one of its top newspaper executives responded to NPR's requests for comment. Colacioppo, the Post editor-in-chief, said Ryckman's allegations about the Plunkett story and his departure were personnel matters that she could not discuss. She deflected NPR's requests to comment more broadly on the aspirations and fortunes of the Post: "I'm pretty busy these days without much administrative help." On a recent trip to Denver, I encounter the city's mayor blinking in a blazing sun at an event celebrating United Airlines' $1 million gift for a local community center serving single-parent families. The temperature would rise to 100 degrees that day. Mayor Michael Hancock tells me he's a fan — by and large — of the news, and of the Post in particular. When he was growing up, Hancock says, he would read both the Post and the livelier Rocky Mountain News. The News went out of business in 2009. "I will tell you that being around Denver all my life, being a political junkie if you will, I have learned and watched and observed how our democracy works through the media," Hancock says. "While it's not always fair or what I want to read even, if it, you know, is about me in particular, I understand the importance of a free, uncensored media in our nation," Hancock says. A TV news crew was on hand to cover United's contribution. An oversize check for $1 million is irresistible for TV. Not a huge story, but a real one. The Post covered the story with statements from a press release. It's doing that more often than it used to. The group's website, ColoradoSun.com, embarked on a Kickstarter campaign and is expected to launch soon. Ryckman says it aims to build loyalty and promises it will be advertising-free. Instead, the Colorado Sun will build on donations large and small as well as foundation grants. "What we're trying to do is to demonstrate to Colorado that these are the stories that you want to read, [that] these are the stories that you need to read," Ryckman says. There's no guarantee of success. But he says staying at the Post would have been a losing proposition, as the paper has been hobbled in seeking to fulfill its mission. Ryckman says the Post's journalists are having to labor awfully hard to do good work — in spite of their bosses, rather than because of them. Colorado's largest news organization, The Denver Post, is shrinking. It has just 60-some journalists to cover a fast-growing metro region with nearly 3 million people. NPR's David Folkenflik reports that the Post's decline has stirred concerns and inspired former staffers to start a competing digital publication. DAVID FOLKENFLIK, BYLINE: I encountered the mayor of Denver blinking in a blazing sun. It's rising to 100 degrees, but here he is with other local officials celebrating a corporate gift to help single-parent families. FOLKENFLIK: Mayor Michael Hancock tells me he is a fan by and large of the news and of The Denver Post. MICHAEL HANCOCK: I will tell you that being around Denver all my life, being a political junkie, if you will, I have learned and watched and observed how our democracy works through the media. FOLKENFLIK: The Post gave big headlines to unflattering incidents involving the mayor and his son, yet Hancock says he was proud to participate in a rally for the newspaper's staff earlier this year. HANCOCK: While it's not always fair or what I want to read, even if it, you know, is about me in particular, I understand the importance of free, uncensored media in our nation. FOLKENFLIK: At that event unveiling the donation for single-parent families, a Denver TV news team was there. The Denver Post quoted press releases. The paper quotes press releases a lot more than it once did. I met Dana Coffield in the lobby of the landmark Denver Post building across from City Hall. Except The Denver Post is no longer there. Coffield is a former reporter and editor for the paper. It's got some pretty inspirational words and messages here. What does it say on the wall there? DANA COFFIELD: Investigate. Report. Record. Illuminate. Reflect - journalism. FOLKENFLIK: So these are all great words. How much of that gets done here in this building? FOLKENFLIK: After two rounds of layoffs last year, the Post said it would move its journalists out to save money. Most now work at its printing plant in the suburbs. The idea was to stave off future job cuts. Then news came in March - more sweeping layoffs. A private investment group called Alden Global Capital owns the Post. The newspaper industry faces grim trends, but The Denver Post is widely believed to be profitable. Yet it keeps getting cut. The paper's newsroom is less than a third of what it was. Again, Dana Coffield. COFFIELD: So in addition to running a breaking news team and having a couple of enterprise reporters, I had to do Web production. I was liaison with the photo department. I was, you know, jack of all trades and very quickly becoming master of none. FOLKENFLIK: So she quit. Alden Global did not respond to requests for comment. The paper's top editor wrote me that she is, quote, "pretty busy these days without much administrative help." AGUILAR: ...Been a - yeah, it's the doughnut around Denver essentially. FOLKENFLIK: Denver Post reporter John Aguilar says all those layoffs have taken a toll. AGUILAR: We're kind of starting to find people's breaking point now, whereas the previous cuts I think people kind of hung in there and just tried to see what would happen next. Now you're just seeing people leaving in large numbers beyond the cuts that were made in March. And I hadn't seen that happen before. FOLKENFLIK: In a rented WeWork space around the corner from the old Denver Post building, you can find The Colorado Sun, a new digital news outlet started by former Denver Post veterans including Dana Coffield. The site's top editor is Larry Ryckman. LARRY RYCKMAN: So we decided to take a different approach. What we're trying to do is to demonstrate to Colorado that these are the stories that you want to read. These are the stories that you need to read and to build loyalty. FOLKENFLIK: Coloradosun.com promises to be advertising-free. RYCKMAN: At the end of the day, we rise or fall based upon the support that we get from the people of Colorado. And that means people giving us $5 a month or maybe $5,000 to help us out. FOLKENFLIK: Ryckman had been a senior Post editor. He quit after he wasn't allowed to name Alden Global in an article on the paper's former editorial page editor who called for the paper to be sold. Ryckman says the Post is now too hobbled to fulfill its mission. RYCKMAN: Those are a lot of stories that aren't getting covered - people who aren't being celebrated, bad guys who aren't being exposed, corruption that isn't being exposed. We just don't know. We don't know what we have lost as a community. FOLKENFLIK: What's happening at the Post in Denver is mirrored in communities across the country. Ryckman says the Post's journalists are laboring awfully hard to do good work in spite of their bosses rather than because of them. David Folkenflik, NPR News, Denver. Transcript provided by NPR, Copyright NPR.